I made a big batch of these to share with the neighbors this holiday season. One bite and I was thinking I should keep them for ourselves. Haha! It was hard, but I packaged them and gave them away. While shooting this, I helped myself to a couple of pieces. It was hard to stop at one. Then after dinner, I had another. I know, I can’t help it. They’re THAT good. The end (have a great weekend, by the way!). In a medium bowl whisk together flour, baking powder, ground cinnamon, salt and baking soda; set aside. Using a stand or electric mixer (or mix by hand) mix together sugars, butter and vanilla extract until combined. Add eggs and continue to mix. Slowly add the dry ingredients to the wet ingredients and mix until just moistened. Batter will be thick. Fold in chopped gingerbread Twix. Scrape the batter into the prepared pan and spread it evenly with a spatula. If using white chocolate chips, sprinkle on top of the batter. Bake for 25-30 minutes or until edges turn golden brown and toothpick/tester inserted into the center comes out clean. Allow the blondies to cool completely before cutting into squares. I love that these have actual twix bars in them! They look yummy and festive…anything gingerbread makes me swoon really 🙂 . I will catch all you throw at me Anne. Sweet!!! Oh my word these look amazing! Gingerbread twix?! How come I do not have like 5 bags of those sitting in my candy bowl right this second. I need to search these out. This looks soo good Anne! Love the Christmas flavors like cinamon and gingerbread in the recipe, it makes the cookies so festive. You must be the best neighbor in the world! 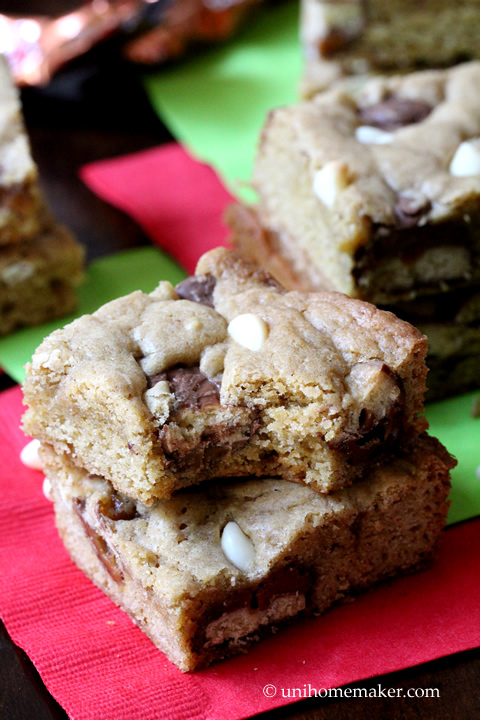 These blondies look great, love the gingerbread taste! These blondies look mouthwatering, Anne. Lucky neighbour! Your recipes always make me drool (not quite literally ;)). I love the sound of this one! Can I move next door? 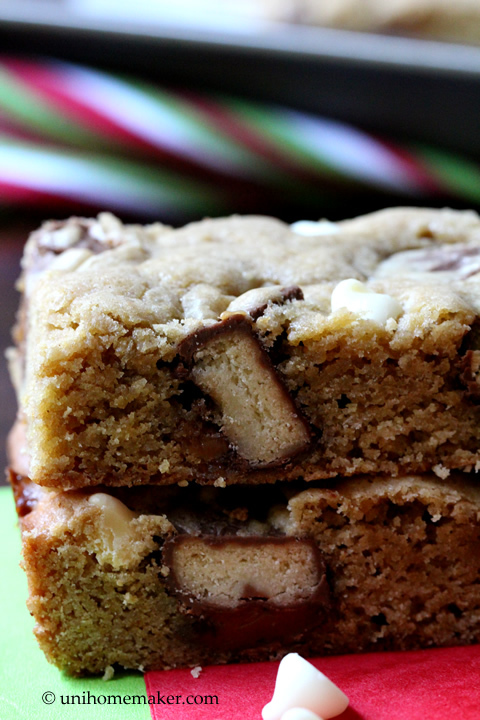 Love this spicy holiday twist on Blondies, Anne! I could eat the entire pan. Thanks for sharing and have a great weekend! These would be very hard to resist – decadent & delicious! Okay, I had no idea they even made gingerbread twix! haha Sometimes I feel like I live under a rock or something : ) These blondies sound delicious Anne! Have a great weekend too!! I recently saw the Gingerbread Twix and am kicking myself for not picking them up! Have a great weekend Anne! I love me some Twix so you don’t have to sell me on these! Looks addictive (in a very good way). It was wise to share and spread the blondie love. Enjoy the weekend and upcoming holiday! Wait there is gingerbread twix?? WoW I have been deprived. So glad you posted this recipe. And I wish I lived next to you. It looks amazing. I hope you have a great weekend. love these! never heard of blondies before! I loved the texture of these. Nice and chewy, and the twix cookie crunch is really a great contrast. Yep, the gingerbread and cinnamon flavors are perfect for this time of year. Wow, less than 5 more days until Christmas. Are you ready?? While I can’t get my hands on these twix bars, I can very well imagine the flavors. Stunning bars Anne! You deserve as many as you want, after all it’s christmas! I know treats are especially good when I feel bad about giving them away! The twix are such a fun addition! Lucky neighbors i say! Those blondies look such a great treat. Yum! Can you believe I have never eaten gingerbread twix , did not even know they exist. 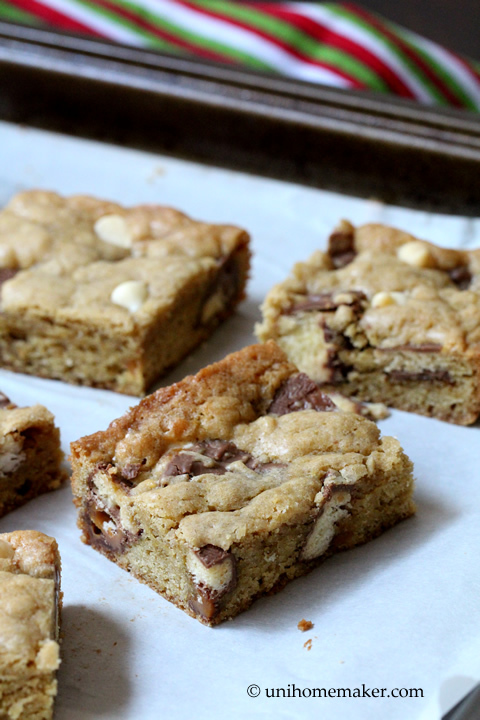 Your blondies look fantastic and wish I could have some right now. Twix are one of my favorite candy bars ever! I’ve never combined them with gingerbread, but now I am intrigued. Sounds delicious!! I didn’t know Gingerbread Twix existed, but I’ll have to keep a lookout for those. These blondes look amazing! Scrumptious bars. Perfect with coffee, I believe! This really is baking season, isn’t it? Love this time of year! 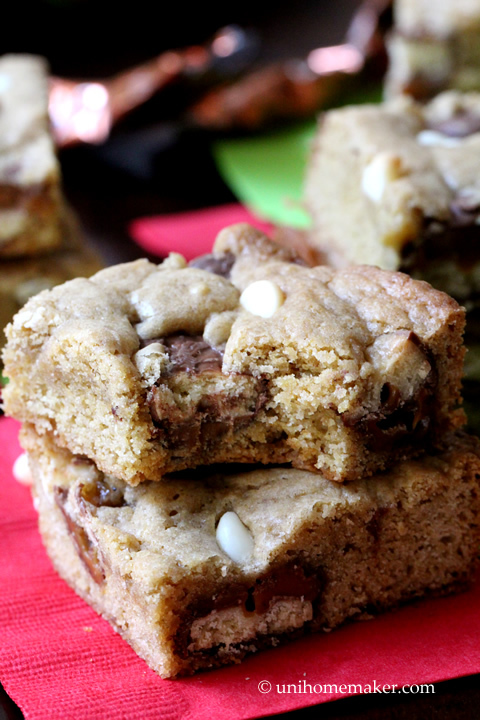 And love this recipe – these blondies look super delish. Good stuff – thanks. with twix bars? my oh my! Love it! I love Twix – this is a wonderful idea! I’m so bummed that I was not able to find the gingerbread twix – they sound delicious! 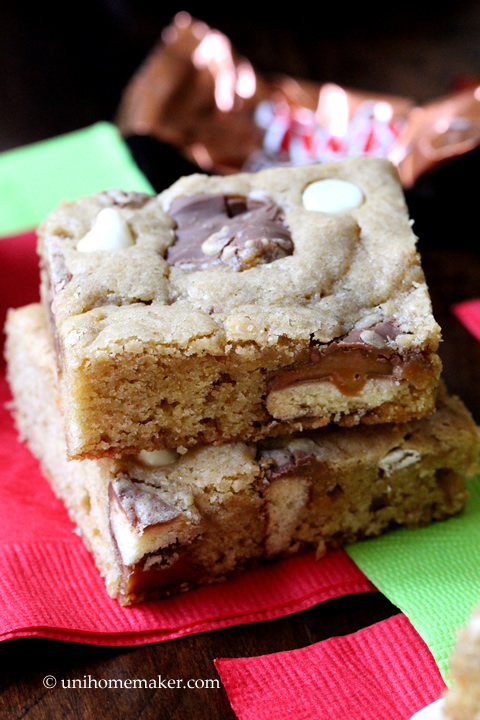 These blondies look amazing – perfect for Christmas! How did I not even know there was such a thing as Gingerbread Twix? These bars look amazing Anne!